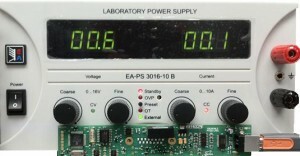 The Pyxis LPSC is a precision power supply control interface, connected via an opto-isolated USB port, specifically designed to remotely control a range of EA laboratory power supply units (PSU). Power supplies are available at 16, 32 & 64 volt nominal outputs with 320 and 640 watt power outputs. The Pyxis-LPSC provides control of the set voltage and current limit and gives feedback of the actual voltage and current. On a 16v / 640w PSU the output voltage is programmable from 0 – 16V and the current 0 – 40A. Control of the Pyxis LPSC is by the Sorion Binary Protocol over a USB connection. The Pyxis-LPSC is fully plug and play with Microsoft Windows XP and Windows 7.